Ted Koppel, a longtime journalist, slammed cable news stations for their wall-to-wall coverage of President Donald Trump, also noting how the stations are benefitting financially. 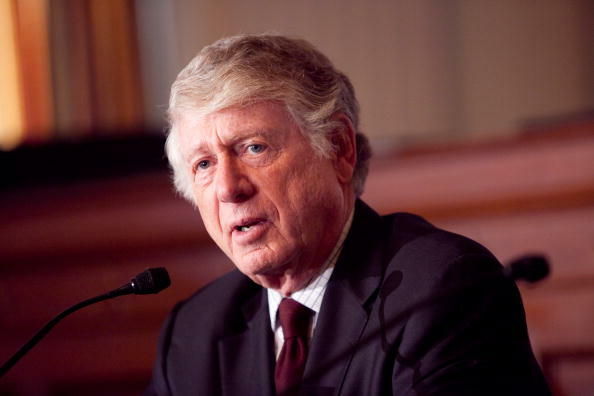 During a National Press Club discussion on Oct. 1, Koppel, 78, a former 25-year anchor on ABC’s “Nightline,” referenced how a number of media executives have admitted publicly that Trump is good for ratings, as his supporters and detractors like to tune in to see what’s happening. “Money, money … Donald Trump has been wonderful for the industry,” Koppel said. Brian Stelter, a host at CNN who often reports negatively on Trump and conservatives, was also on the panel. “That means what? If ratings are up, that means what?” Stelter wondered. “The ratings are up, it means you can’t do without Donald Trump. You would be lost without Donald Trump,” Koppel said, though Stelter shook his head and claimed it wasn’t true. “CNN’s ratings would be in the toilet without Donald Trump,” Koppel added, prompting laughter from the audience. Stelter said CNN and other networks aren’t making that much money covering Trump and claimed that it would be okay if CNN’s ratings fell 40 percent. Koppel then transitioned to another network to make a point, noting how talking about CNN seemed to be a “sensitive subject” for Stelter. Trump took a unique path on broadcasting his views during the presidential race, often calling in and appearing across the major networks. Some called it free advertising. MediaQuant, a tracking firm, claimed he received $4.9 billion in free advertising from Nov. 2016 to Nov. 2017, versus $3.2 billion for Hillary Clinton. “He bypassed paid advertising to bask in the attention and validation of a 24-hour news cycle,” the firm stated. President of CNN Worldwide, Jeff Zucker, admitted during a conference in Jerusalem in March 2017 that Trump was financially prosperous for CNN, reported Deadline. Les Moonves, the recently ousted CBS CEO, said Trump was good for his network in early 2016. “It may not be good for America, but it’s damn good for CBS,” he said, according to the Hollywood Reporter. “I’ve never seen anything like this, and this going to be a very good year for us. Sorry. It’s a terrible thing to say,” added Moonves, who has been accused of sexual harassment by multiple women. Many major networks have reported mostly negatively about Trump. According to the Media Research Center, a conservative watchdog group, coverage of the White House has been at or around 91 percent negative across ABC, CBS, and NBC since Trump started campaigning in 2016. The Pew Research Center, a moderate survey group, found news coverage on Trump’s first 100 days by left-leaning media outlets was only reported positively on 5 percent of the time.